When the temperature goes up, here’s a refreshing way to cool down. This Watermelon Spritzer is simple to make and contains significant levels of vitamins A, B6 and C, lots of lycopene, antioxidants and amino acids. Place the watermelon in a blender. Cover and process until blended. 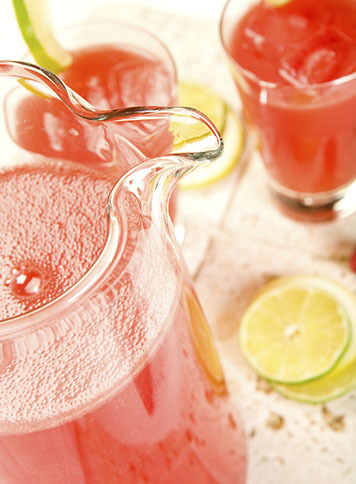 Strain and discard the pulp; transfer the juice to a pitcher. Stir in limeade concentrate and refrigerate 6 hours or overnight. Just before serving, stir in carbonated water, pour over ice and garnish with lime slices. There has always been a debate whether a tomato is a fruit or a vegetable. What experts do know is that tomatoes are great for you! 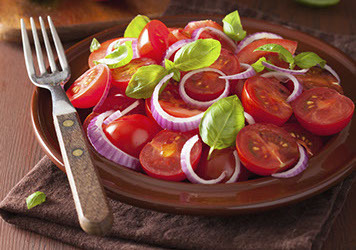 Tomatoes are a rich source of vitamins A and C and folic acid. Tomatoes contain a wide array of beneficial nutrients and antioxidants, including alpha-lipoic acid, lycopene, choline, folic acid, beta-carotene and lutein. Combine the tomatoes and onions. Spread out on serving platter. Season with salt and pepper. Drizzle the olive oil and balsamic vinegar over evenly. Sprinkle the basil leaves on top. Garnish with while sprigs of basil. This recipe tastes best when prepared 1 hour ahead of serving and allowed to sit at room temperature.